A major stumbling block for post tribulationists and recapitulationists? This scripture appears after the sixth seal is opened and just before the seventh seal is mentioned and just before the Seven Trumpets sound. It is part of the Interlude between the sixth and the seventh seal. The other part of the Interlude being the rapture of the great multitude. The four angels mentioned in the scripture above are considered to be the same angels as the those who hold the first four trumpets. Pre tribulationists argue that this is proof that the seals and the trumpets cannot be simultaneous as stated by recapitulationists (post tribulationists), or at least the trumpets cannot precede the sixth seal. The seals trumpets and bowls, therefore, occur sequentially. Pre tribulationists contend that the rapture is after the sixth seal when the Great Multitude appear in heaven just before the seventh seal is opened and certainly before the seven trumpets (which are considered to be the wrath of God). Post tribulationists tend to be recapitulationists, stating that various visions in revelation recapitulate and occur simultaneously with other visions in Revelation thereby adding to their meaning. Like pretribulationists, they place the rapture after the sixth seal immediately before the seventh seal is opened. The rapture is also linked to the seventh trumpet which is concurrent with or simultaneous with the seventh seal. God’s wrath is then poured out on the nations; namely the seven bowls of God’s wrath which are also part of the seventh Trumpet. How then do post tribulationists account for this scripture which suggests that the trumpet judgements follow the seals sequentially rather than occur simulatanously with the seals. The woman fled into the wilderness to a place prepared for her by God, where she might be taken care of for 1,260 days. The woman was given the two wings of a great eagle, so that she might fly to the place prepared for her in the wilderness, where she would be taken care of for a time, times and half a time, out of the serpent’s reach. Here we see the ‘Woman’ (Israel) flees to the wilderness where she is taken care of for 1260 days – this is the entire duration of the Great tribulation! Could this ‘Women’ (Israel) be sealed and protected right from the beginning of the Great Tribulation, before any seals are opened or any trumpets are sounded? This would mean that the vision of the 144000 being sealed from the 12 tribes of Israel does not occur in the same sequence that it is appears in Revelation. It is a self contained vision that happens to be placed in the interlude between the 6th and the 7th seal. It is simply not possible to describe the picture in Revelation and maintain sequence without becoming very disorganized. Revelation is like a picture and John describes the elements sequentially one at a time but not necessarily in time sequence. Revelation is not like a scanner or a fax machine scanning a picture from one end to the other. Just as there is an interlude between the sixth and the seventh seal, there is also an interlude between the six and the seventh trumpet. The rapture of the Great multitude occurs in an instant and therefore could well take place at this point in the Revelation sequence just before or when the seven seal is opened. The ‘Women’ (Israel) is protected for 1260 days. The actual sealing of the 144000 is therefore likely to have occurred substantially before the time that it is mentioned in the Revelation sequence. Indeed, it is more than likely that the 1260 days end at the point it is mentioned in the revelation sequence. Just as the 144000 from the 12 tribes of Israel are sealed and protected for the entire duration of the Great Tribulation, the Gentiles will trample the Holy City for 42 months and the two witnesses will prophesy for 1260 days. The visions of the Gentiles trampling the Holy City for 42 months and the two witnesses prophesying for 1260 days are in the interlude between the 6th and the 7th trumpet. When the seventh Trumpet sounds, the kingdom of this world becomes the kingdom of our Lord. We are at the conclusion of this age. That is it. There is no more 42 months to come and no more 1260 days to come. The 42 months and the 1260 days, therefore, end with the sounding of the seventh trumpet. As with the sealing of the 144000, the place in scripture where they are mentioned corresponds to the end of the 1260 days or 42 months over which they occur. In other words, the Gentiles started trampling the Holy City 42 months before the seventh trumpet sounds and the two witnesses prophesied for 1260 days up until the sounding of the seventh trumpet. Similarly, the 144000 from the 12 tribes of Israel were sealed and protected 1260 days before the seventh seal was opened. This means that the 144000 Jews are sealed at the beginning of the Great Tribulation before any seals are opened and before any trumpets are sounded. Therefore, these verses should not be a stumbling block to Post Tribulationists who believe in simultaneous recapitulating visions in revelation. If the seals and the trumpets are simultaneous, with an angel sounding a trumpet whenever a seal is opened, then seal one coincides with trumpet 1, seal two coincides with trumpet 2, seal three coincides with trumpet 3 and so on. When the first seal is broken, the Antichrist is revealed. The first trumpet sounds and then a third of the Earth’s trees and grass is burnt up. When the second seal is broken, war is unleashed. The second trumpet sounds and a third of the sea turns to blood and a third of the sea creatures die and a third of the ships are destroyed. When the third seal is opened, famine is rampant. The third trumpet sounds and a star falls from the sky turning a third of the fresh waters bitter. When the fourth seal is opened, death abounds. The fourth trumpet sounds and a third of the sky is darkened blocking the light of the sun and moon. When the fifth seal is opened the martyrs cry out. The fifth trumpet sounds and locusts come out of the abyss to torment those with the mark of the beast for 5 months. When the sixth seal is opened, signs appear in the sky and earthquakes shake the Earth. Men try to hide from Gods impending wrath. The sixth trumpet sounds – 200 million mounted troops are released to kill one third of all mankind. Still man does not repent! Next, the 144000 Jews are sealed and a great multitude appear in heaven. When the seventh seal was opened, there was silence in heaven for half an hour. The seventh trumpet sounds as the seventh seal is opened and the mystery of God is accomplished. The little scroll is opened, the two witnesses finish prophesying for 1260 days and then they are raptured. Jerusalem has been trampled for 42 months. The time for judging the dead in Christ has come. The church is raptured and the first resurrection takes place. God pours out the seven bowls of his wrath as he leads an army of believers to strike down the nations. The nations are separated into the Sheep and the Goats. Finally, the Kingdom of this world becomes the Kingdom of our Lord and his Messiah. There are no clashes, in fact this paints a glorious picture that only God could have conceived. It paints a picture with signs that could not be missed or mistaken for something else. 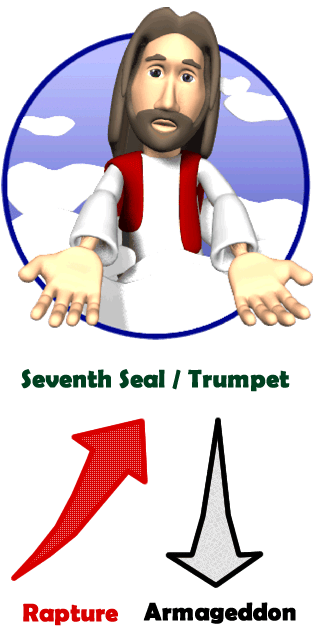 While the seventh seal and the seventh trumpet appear to be simultaneous events associated with the second coming of Christ, we cannot be so sure that the other trumpets are simultaneous with the other seals. Thus there is good reason for believing that the seventh Seal and the Seventh trumpet are concurrent events in heaven. In fact the rapture appears to occur in the twinkling of an eye at the beginning of the seventh trumpet (Rev 10:7). The rapture, if it does not precede the seventh seal being opened, would also appear to occur the instant that the seventh seal is opened (Rev 8:1) and then there is silence in heaven for half an hour. Could then the other trumpets correspond to the other seals? Coud seal 1 be coincident with trumpet 1, seal 2 coincident with trumpet 2, seal 3 – trumpet 3 and so forth? If this were true then when Christ opens a seal, an angel sounds a trumpet. For those who are watching, this would serve as a warning that Christ’s return is becoming more imminent. What would it look like if the seals and the trumpets were aligned? Are there any events that cannot go together or would clash?